There are several things I look forward to once this new house is finished. First up? No mold. I can’t tell you how grateful I will be for this! Autumn+mold=discomfort. Just saying! I look forward to having a bedroom that will hold all of our personal belongings. Living in a mouse free home. Having a heat system that works properly. Being in a quiet community. Finally settling into one place where I can arrange and decorate according to taste. And I’m especially eager to get into a welcoming, well-lit kitchen! Between my whole food diet and preserving a large portion of what we eat, I spend several hours in the kitchen every day. Sometimes more. Happy as I am with our current rental home, I struggle with the low lighting in the kitchen. A tiny window hemmed in by trees, dark red walls and black countertop wouldn’t be my first pick. I’m just itching for that new kitchen. And because I must spill my eagerness somewhere, I’ll spill it here. At this point in the journey, this is what we’re thinking. The cottage structure will be laid out in an L. Both kitchen and dining room fit in the short portion of the L! Which happens to be 10 ft long and 20 ft wide. The kitchen will be on the south side with the dining area on the north. My one request with this house (ok, maybe I had a few) was that my kitchen it wouldn’t be open to the common living areas. Apart from the dining room, that is. This cook needs walls to her kitchen. The space needs to have it’s own flair and flavor. And I? I need to be able to escape both into and out of it. Walls please, carpenter husband? He understood. And above the sink, I’ll have a 4 foot wide window facing due west. It’ll look out over my kitchen garden, the poultry pens and the house drive. Ah, the sink. I’ll bet you imagine something like this? So did I. In fact, if I could have my way, I’d choose this exact design: a double sink with a wide flange at the back. No water hanging out behind, please! But have you ever check the price tags on these beauties? My man says it’s an unnecessary cost, that installing one of these heavy beasts requires extra labor, that our salvaged stainless steel will do just as well. I mostly agree. 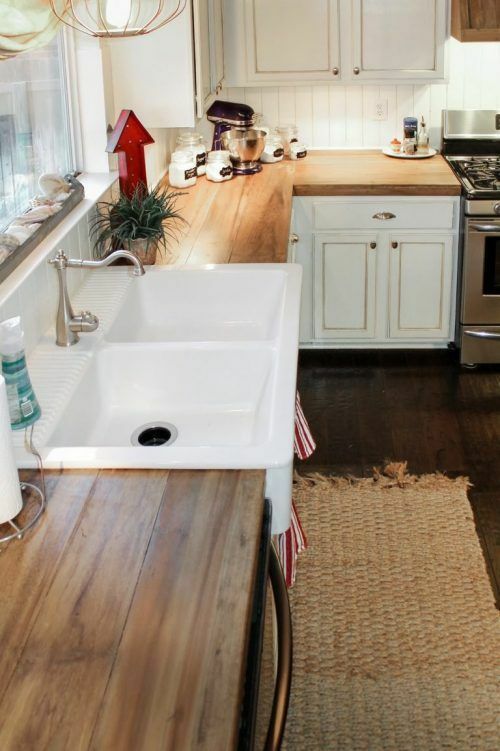 But there’s still a little part of me that just keeps wanting a cast iron, enamel-lined, vintage-looking farmhouse sink. Used or not, I think it would suit. I tell myself it won’t matter. That we’ll get out of debt faster if we cut extra costs. Like beautiful, farmhouse sinks. 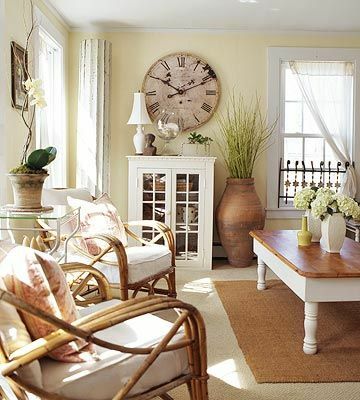 We’ve chosen our wall paint color: lemon lily, a soft, creamy yellow. Both kitchen trim and lower cabinets will be a staunch white. No darkness in this kitchen, please! I know. I know. White is hard to keep clean. But the brightness of it draws me in and I can’t refuse. This photo matches our color designs to a T! Yes, this is a living area. But you get the idea, right? The room still has color, but is incredibly soft. And actually, we have the same color scheme running throughout our entire house. So this almost could be our living room! My man has decided to make our countertops. Being a carpenter, he has opportunity to salvage lots of material! We currently have a 4 ft stack of old, oak flooring in our basement, just awaiting his handiwork. I think we might go for that rustic, beat up look. Say, when my man mentioned beating oak wood with a chain to make it look ‘aged’, I thought he was kidding. Turns out, it’s really a thing! Did I mention he’s also making the white lower cabinets? The table. I can’t forget to tell you about the table. Instead of lining the 10 foot east wall with countertop, I’ve decided to put an old table there instead. Almost every place I’ve lived, I’ve had a table acting as a island. And know what? I actually prefer it now. 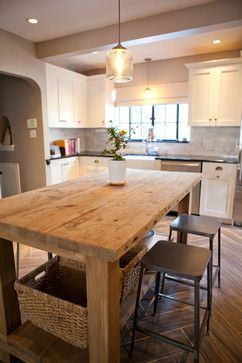 You can drag a table about, seat guests around it, treat it like a countertop or even lug it out of the room to open things up. An island? It’s usually stationary. I plan to make my table-like-thing narrower than a dining table. It will be rustic and beat up. I want a kitchen surface I can do farmish things on without worrying over the finish. Here’s where folks think I’ve lost my marbles. But actually, we aren’t putting in ANY overhead cabinets! Not one! Shelving will be made from thick slabs of fir (I’ve placed an order with my sawyer brother) and likely be painted white. Two above the table island with two or three to the left of the sink. 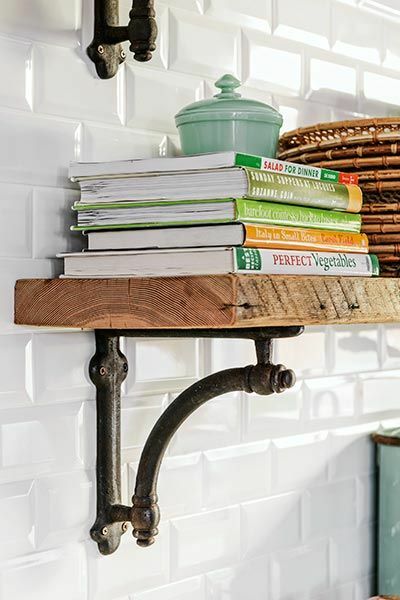 They will be held in place by heavy-duty, ornate cast iron brackets. These are the exact ones I’ve been thinking about. I do have plans for a wall hutch on the right side of my sink. But not in this yellow, of course. I think we’ll revert to white. This space will hold dinner and dessert plates, both eating and mixing bowls, jars (of course) and whatever else needs a home. We’re going for the colonial, cast iron look! Knobs, drawer pulls, hinges and the hooks for hanging my cast iron collection will be a flat, basic black. No designs or patterns. Simple and sweet, with black on white. Yellow, black and white. Hmm. The colors of the bumblebee. Doesn’t sound very nice, does it? But I think it will be. We’re building our house on a slab. Flooring throughout the house will be concrete until we have the money to add in the real deal. Until then, a concrete stain is on our “to-do” list. So there you have it. As of now, these are our hopes and ideas. Did I give you the whole plan? Of course not! I didn’t mention the ginormous cold room and pantry just off the north end of our kitchen/dining room. Or the freezer storage area. The beautiful ceiling beams we plan to add throughout the kitchen/dining area. Our lighting of choice. A backsplash. Or the kitchen door that leads out into the garden. You’ll just have to wait until it becomes a reality. It may take several years, but you can be sure I’ll keep you posted as we go!